Image caption Anders Bering Breivik killed 77 people in a terror attack. Does he still have the right to be be a student? How should a university treat an application from a mass murderer? This was the question facing the University of Oslo, when Norwegian mass killer Anders Behring Breivik applied from prison to take its political science degree. In July 2011, Breivik had killed 77 people in a bomb and gun terror attack in Oslo and on the island of Utoya. The university's decision on whether to teach him was made particularly difficult because some of the people killed by Breivik had been friends with students at the university. He had even named professors at the university as targets in his far-right "manifesto". And in what the university's vice-rector called a "traumatic paradox", Breivik's chosen degree would involve studying the very political institutions his extremist ideology had attacked. Nevertheless, three years ago the university agreed to let Breivik study under strict conditions and he has continued as an undergraduate student, taking a course which includes political theory, party politics, public administration and international relations. Course materials are given to him by a prison officer and he has no contact with students or academics or access to the internet. The university said teaching Breivik (who has since decided to change his name) was about honouring the right of prisoners to pursue higher education if they meet the admission requirements. Former rector Ole Petter Ottersen said it was "for our own sake, not his." Professor Svein Stolen became Oslo's rector last year and agrees with his predecessor's decision. "There is not one opinion in a large university and it is more difficult for those that were closely affected, but to some extent I feel that we are collectively satisfied that we chose this solution," he said. "It was not easy but I think it was a kind of principled action from the university." Prof Stolen said the university's first consideration before accepting Breivik's application was the welfare of students and staff. "It was extremely important to take care of the other students, the teachers and the administration, so there were a lot of discussions about how we can ensure that this does not affect them too much," he said. Professor Ase Gornitzka, Oslo's vice-rector, said she saw Breivik's attack as being partly against the university, because it is part of Norway's liberal democratic political order. She said the university's response was in line with the wider Norwegian response to Breivik. "It is very low key and part of the general sentiment in Norway that he is not given any space," she said. "He has rights by law to take studies but of course he cannot come here or engage in the ways that normal students do." Thomas, a former student representative at Oslo University, knew people who were killed in the attack and now refuses to dignify Breivik by even saying his name. "Not because of fear but because he does not deserve it," he explained. "Fame is what he wanted." 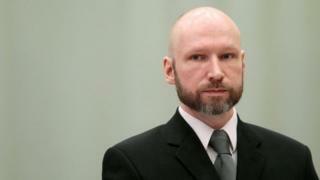 He is worried that Breivik might only be taking the course to show that he has changed and thereby try to get out of prison. Nonetheless, Thomas supports the university's decision. "I can't see him being let out [of prison], but if he does it is better he is an educated man than if he is not," he said. "Revenge is not part of the penal system, it is for rehabilitation." Emil, a recent graduate from the university, said he thought Oslo's leaders did the right thing, even though it was a controversial decision. "It was a test for Norway's liberal policies when Anders Behring Breivik did this awful thing. But education can only be good for him," he said. Is the university's decision, and the response to it, particularly Norwegian? The country is renowned for freedom, tolerance and equality, and perhaps a university in the UK or the US would not have accepted someone with Breivik's criminal record. Anthony Seldon, the vice-chancellor of Buckingham University, said he would have deferred the decision to the families of Breivik's victims. "I'm a deep believer in the power of education to change human beings for the better, and in the power of redemption," he said. "But this man has done such unspeakable horror to so many, that it is not in the gift of the university to decide," he said. "If the families of the victims overwhelmingly believe he can receive an education from the university, and if he expresses remorse, then he should. But if they are caused further grief by it, it's a no no." Seven years after the attack, Thomas said Norway has finally recovered from the tragic events. "Only now is Norway back to where it was," he said. "We are not victims any more."